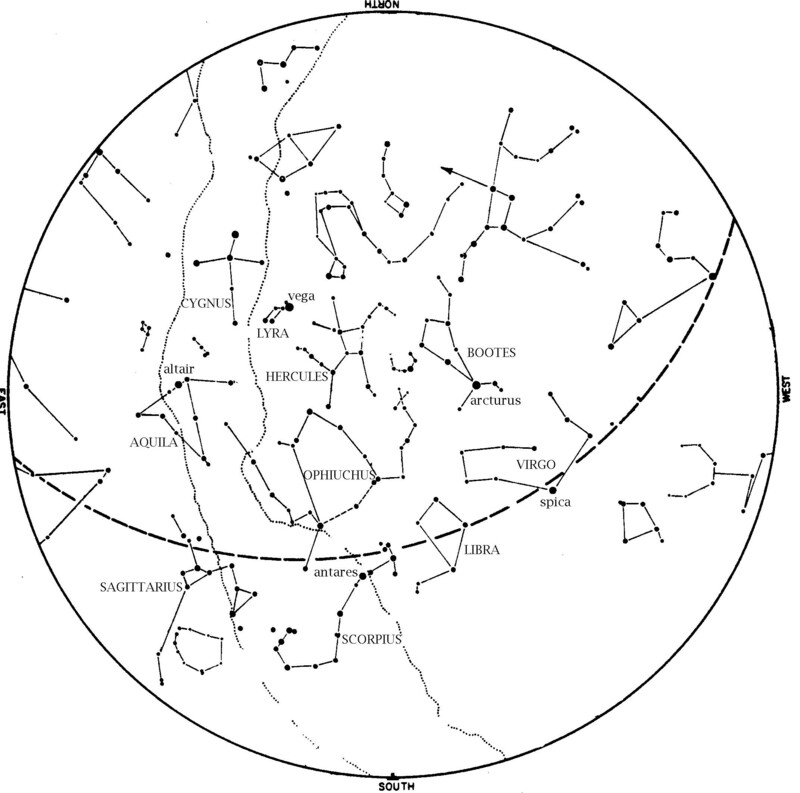 This star map shows the Houston sky at 10 pm CDT on July 1, 9 pm CDT on July 15, and dusk on July 31. To use the map, put the direction you are facing at the bottom. The Big Dipper is above the North Star, with its handle pointing up. From that handle, you can ‘arc to Arcturus’ and then ‘speed on to Spica’; those stars are in the west at dusk. Leo, the Lion, is also in the west at dusk. Jupiter is to the left of Spica in Libra. Antares, brightest star of Scorpius, the Scorpion, is in the south. When you look at Spica and Antares, see if you notice the color difference between them. All stars seem white at first glance, but Spica is blue enough and Antares red enough for you to notice the colors by contrasting them. What your actually seeing is that Spica is almost 39,000 degrees (F) hotter than Antares! Of course Antares, at ‘only’ 6,750 degrees F is still quite hot. The ‘teapot’ of Sagittarius to the left of Scorpius, with Saturn right above the ‘teapot’. The Summer Triangle, so-called because its stars are up all night long this time of year, has fully risen in the east. The stars of summer are here. Venus remains high in the west at dusk this month. Look for it low to the horizon, over the point of sunset. Venus outshines everything in the sky but the Sun and Moon, so you can look for it even in twilight. Venus remains the evening star all spring and summer. Jupiter was up literally all night long on May 8. It is now well placed for evening observing, in the south right as night falls. Saturn was up all night long last month. It remains well placed for evening viewing, in the south southeast at dusk, all month. Although significantly dimmer than Mars or Jupiter, Saturn outshines the stars near it, and is therefore just as easy to see. Mars is as bright as it has been since 2003, and it won’t appear any brighter until 2035. By July 4, Mars is now brilliant enough to match Jupiter in brightness, far outshining all of the stars in the sky. From then until September 7, Mars actually outshines Jupiter in the sky. That’s because on July 27, just after midnight, Earth passes between Mars and the Sun on its faster orbit. This alignment, called ‘opposition’, puts Mars in the sky literally all night around July 26- 27. But not all oppositions are the same. Mars’ orbit is about five times as elliptical as Earth’s. therefore, it matters whether Mars is near perihelion (as close in towards the Sun as possible) or near aphelion when Earth passes it. In 2018, Earth aligns with the Red Planet near perihelion, making this opposition better than most. On July 1 Mars rises at about 10:30, but it rises a little earlier each night until it comes up right at sunset on the 26th. Face southeast in late evening or southwest at dawn to see it. 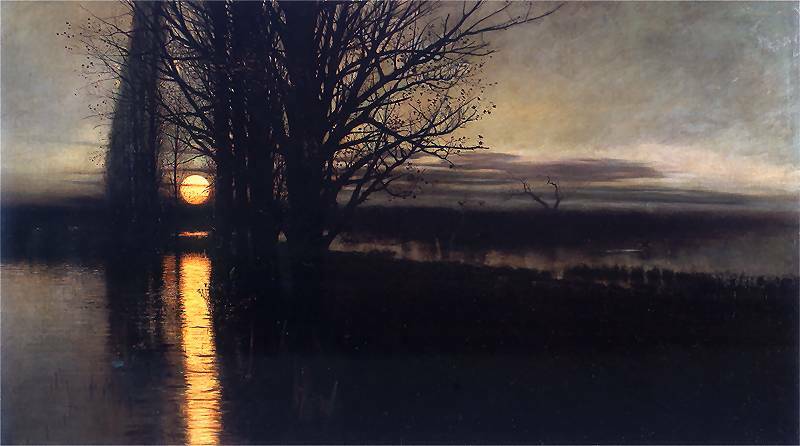 Last Quarter July 6, 2:51 a.m. New July 12, 9:48 p.m.
1st Quarter July 19, 2:52 p.m. Full July 27, 3:21 p.m.
“Moonrise”, 1884, picture by Stanisław Masłowski (National Museum, Kraków, Gallery of Sukiennice Museum). Source: Wikimedia Commons. You may have heard about a total lunar eclipse for the night of July 27. Indeed, the Full Moon does enter the Earth’s shadow on that date, but absolutely none of that eclipse is visible anywhere in North America. (The whole event occurs during our daylight hours, when the Full Moon is not up.) Viewers in Europe, Asia, Africa, Australia, and eastern South America can enjoy 1 hour, 45 minutes of totality. We, on the other hand, must wait until Sunday night, January 20, into Monday morning, January 21, 2019, for our next total lunar eclipse. At 11:46 am on Friday, July 6, the Earth is as far from the Sun as it will get this year; we say Earth is at aphelion. So why isn’t it any cooler? Remember that the Earth’s orbit is almost a complete circle. While we are indeed closer to the Sun in January and farther away in July, that difference amounts to only about 3% of the Earth’s average distance. This produces, a tiny, negligible effect compared to the effect of Earth’s 23.5 degree tilt on its axis. Don’t expect any cool weather around here for a few months. Great work, as always, James!